Since its rise in the 1970s, mainstream environmentalism has been viewed by many as a “new social movement.” As with the liberal and radical civil rights, feminist, queer, and decolonial movements, environmentalists have been accused by many radicals of fracturing left unity and promoting “interest group” politics over those of class or revolution. Indeed, while mainstream environmentalism implicitly (if sometimes explicitly) included a critique of capitalist accumulation’s excesses and its degradation of nature, these were generally seen to to be aspects of historic capitalism that could be patched over in order to make our lives in it livable. And so throughout the 1990s, many environmentalist groups courted the corporate world through green consulting and rhetorics of “sustainable capitalism.” But the use of symbolic tactics by many of these groups failed to make a substantial impact on public opinion or state action. They may have kept “the environment” alive as an issue in public debate, but neither determined its political content or catalyzed widespread political action, despite its adding to the proliferation of “green” consumerism. All the while, the accumulation they critiqued continued at an ever-faster clip. Most of us tend to operate as if “nature” and “society” are separate entities that interact in various ways. Moore calls this nature-plus-society thinking “Green Arithmetic.” Everyday life under capitalism generally primes us to think of nature as our resource and, conversely, our impacts as ecological footprints. A left version of this is evident in the subtitle of Naomi Klein’s latest book Capitalism vs the Climate, while a neoliberal version is apparent in The Ecomodernist Manifesto’s proposal to “decouple” capitalism from the environment through intense technological development — “making more room for nature.” But even in more general ways, we often act as if nature is one of three things: a tap (of resources), a sink (for waste), or an external limit (for economic growth). Rarely do we think of ourselves and our social and economic organization as aspects of nature. The oikeios is a multi-layered dialectic, comprising flora and fauna, but also our planet’s manifold geological and biospheric configurations, cycles, and movements. (…) From the perspective of the oikeios, civilizations do not “interact” with nature as resource (or garbage can); they develop through nature-as-matrix. This understanding leads Moore to argue that “Nature can neither be saved nor destroyed, only transformed.” Such a thermodynamic formulation strikes us as profoundly contrary to received environmentalist wisdom — and fundamentally correct. It allows Moore to analyze oil next to labor, the household next to superweeds, contemporary climate change next to 16th century sugar plantations. Each of these is equally historically and relationally produced by and through capitalism, and in turn conditions capitalism’s historic and future ability to extract value from its natures. Perhaps Moore’s most emphatic and important application of oikeios is to tease out the relationship between paid labor power (exploitation) and the appropriation of unpaid work/energy — what Maria Mies succinctly sums up as “women, nature, and colonies.” If we accept that nature is not a timeless background to capitalism, but instead that “historical natures” are produced by and products of modes of production, then it becomes increasingly clear that historical natures and their reproduction are not incidental to accumulation. Natures are the condition of its possibility. This thesis shows how we might answer several problems that have vexed Marxist theory: Is slavery central to accumulation, or a pre-capitalist formation? Did European settler colonization and “frontier” adventures precede and kick-start accumulation (as “primitive accumulation”), or are they necessary to ongoing accumulation? Moore argues that in a long view of capital in and as nature, it becomes clear that accumulation is a dialectic of capitalization and appropriation. 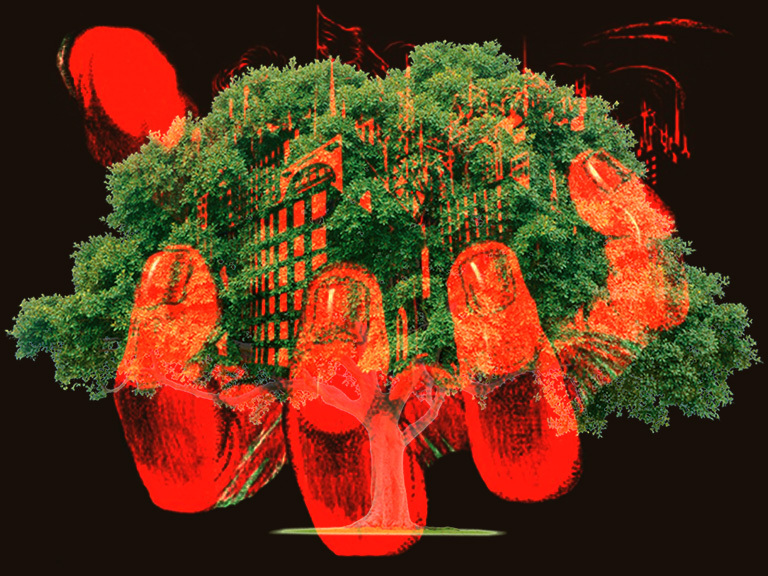 Capitalization—of labor power, of individual products, of land and territory—is the moment of turning nature into capital, bringing it within the sphere of directly market-mediated social relations. It tears out individual units from the web of life, creating discrete entities rather than relationally enmeshed ones. Much of Marxism is rightfully devoted to the study and critique of exploitation. Yet in doing so, Marxist theory has been unable to account for the role of extra-economic appropriation of unpaid labor and nature. By contrast, Moore centers the role of appropriation in the production of value, writing that “value as abstract labor cannot be produced except through unpaid work/energy,” and that “these movements of appropriation must, if capital is to forestall the rising costs of production, be secured through extra-economic procedures and processes.” Through this formulation, Moore seeks to show that the capitalist economy has always relied upon appropriation—of indigenous lands, of slave bodies, of women’s reproductive labor—to supplement and reproduce the conditions for economic exploitation. To capture the importance of appropriation to capital, Moore further introduces the concept of ecological surplus, “the ratio of the system-wide mass of capital to the system-wide appropriation of unpaid work/energy.” The ecological surplus signals the capacity of capital to appropriate sufficient unpaid work to allow for the possibility of accumulation at an acceptable rate of profit. This leads to an important set of historical questions: does the ecological surplus have a tendency to fall (that is, become exhausted, depleted, toxic, etc.)? If so, is capitalism reaching such a crisis point? Is this crisis developmental (leading to a new restructuring of capital accumulation) or epochal (threatening accumulation as such)? For his part, Moore argues that without a sufficient share of ecological surplus relative to capitalization, accumulation is not possible. It is as if capital, when forced to pay the full costs of production, could advance only at the most meager rates of profit; yet over the course of each long wave cycle of accumulation there is a natural tendency for this surplus to fall. Moore suggests four reasons for this. Firstly, there is “wear and tear on the oikeios.” Secondly, the mass of capitalized nature tends to rise faster than new unpaid work can be appropriated. Thirdly, there is a contradiction between the reproduction times of nature and capital—capital must always strive to accelerate, while nature is limited in how fast it can reproduce. For example, fossil fuels can be extracted and burned far faster than geological process can create them or remove their carbon from the atmosphere. Finally, the wastefulness of capital increases, waste accumulates over time, and this waste grows more global and more toxic. Nuclear waste will need to be closely monitored for longer than human beings have existed so far, while toxic e-waste dumps such as Agbogbloshie in Ghana are home to tens of thousands of people. And of course, greenhouse gases keep accumulating in the atmosphere, pushing the planet’s climate towards chaos. The externalities rise, increasingly imposing what Moore calls “negative value.” For example: genetically modified crops are preyed upon by superweeds, which can only be countered by increased labour input or more and more toxic herbicides. Agricultural productivity declines because of the effects of climate change. Pollution from unconventional sources of energy like tar sands and hydrofracking is now promptly identified, and firms are under pressure to be accountable for this, inevitably increasing costs and forming an impediment to accumulation. In order to accept that capitalism is approaching epochal crisis, following Moore, we must accept the necessity of new frontiers of appropriation of cheap work/energy and ecological surplus, agree with his empirical analysis that “peak appropriation” has passed, and acknowledge that there are insufficient new frontiers to make nature cheap again. We could express Moore’s claim here in two forms. In the weak version, capitalism stagnates in sluggish growth without new frontiers (i.e. cheap natures) to appropriate. Expressed strongly, this claim means that capitalism would cease to exist without them. We agree with the former, but are not fully convinced of the latter, although it is the latter that seems closer to Moore’s own position. If we accept the first contention that frontiers are necessary, we must still consider the second: are they really exhausted? Is the era of cheap nature at an end? Here we seem closer to a question which could be answered empirically, and which for us is still open to debate. Moore’s answer, and ours, to the question of how capital creates and absorbs frontiers depends on how we understand the Nature/Society relation. For Marx, a dialectic is a mode of presentation of categories, a way to reconstruct a complex totality of relations in thought. Marx does not claim that reality is dialectical. But Moore collapses this distinction. This provides the basis for his somewhat quick rejection of “cyborgs, assemblages, networks, hybrids” — heuristics he apparently deems insufficient for theorizing the oikieos. Dialectics are concerned with internal relations — relations that are essential to their terms. But not all relations are internal. It is these relational categories which can be reconstructed into a dialectical totality — tracing the web of connections whereby each category co-constitutes the others. This is an important and powerful method, but Moore appears to commit a category error in dismissing a host of alternative ecological approaches concerned largely with external relations (cyborg ecology, Actor-Networks; the turn towards hybrid technonature in geography). The result is a false antithesis in his analysis between Marxist-dialectical methods and cyborg networks. A messy cyborg ontology and a neat dialectical presentation of categories need not be mutually exclusive. But such a productive engagement requires restricting Moore’s dialectic to its proper domain—a mode of presentation of internally related categories. The claim that reality is irreducibly dialectical, and hence that all relations are internal, strikes us as untenable, and an obstacle to an ecopolitics which can turn science against capital and state, creating social relations whereby abstract scientific forms of knowledge can enter into connections with practical, local knowledges. Mathematical abstraction may be indispensable to capitalist economics, but the converse is not true: the relation is only asymmetrically internal. Why then does this split between Nature and Society persist? Although it is clearly necessary to capital’s contemporary historical mode of organizing nature, Moore provides fewer insights into this ideological question. The late Marxist geographer Neil Smith argued that the development of capitalism generated a contradictory ideology of nature as either a frontier to be conquered (capitalist modernity) or a pristine wilderness to be preserved (capitalist romanticism). For Smith, this Nature/Society dualism was the intellectual expression of real historical processes wherein frontiers really have been objectified as sources of raw materials and wilderness really has been created (such as by the clearance of indigenous people to create national parks). The bulk of Moore’s analysis is avowedly geared towards assessing the situation capitalism has ushered in — and its proximity to possible collapse. While this is clearly important, the real test of such analyses is how they allow us to think through what is to be done politically in such a moment. Moore has surprisingly little to say about politics (aside from usual passing references to class struggle and an approving nod towards global food sovereignty movements). The main take-away message of the book is not to conceive nature and society as separate entities or objects and, instead, see them both as historically produced and intertwined. But this is hardly a new insight: in fact, it is thousands of years old. Where Moore seeks to historicize capital’s organisation of nature through an analysis of successive energy regimes and agricultural revolutions, he misses the opportunity to historicise the nature/society dualism itself, and thus to understand both its persistence and its kernel of truth: “nature” really does appear to capital as frontiers to conquer, resources and labour power to exploit, a sink in which to dump pollution, etc, even if, in fact, capital is a way of organising nature and not an external force which encounters it. That is, nature/society dualism reflects capitalist modernity as it really appears: an ideology of nature. Thus posed in its relation to nature, capitalism’s current crisis can be reassessed as either developmental or epochal. To us, it will be epochal only to the extent to which we participate in making it so. Getting out of the ideology of Green Arithmetic requires much more than better thinking about or developing better language for the world we live in. It requires that we begin to operate as if nature were truly important to capitalism; and by nature, we mean us. The political upshot of such a move is that our struggles against capital appear less symbolic, and more material; not as dialectical, but necessarily messy; not marginal, but crucial to capitalism’s demise. We would need deeper and more coordinated global organization of ecological agitation; blockades by workers, scientists, indigenous peoples, farmers, and refugees. We would still need, that is to say, a struggle. While Moore rarely says as much, the key for us is that we cannot wait for capitalism’s epochal crisis nor think our way into another world; we must begin building it today. Originally published, slightly abridged, at The New Inquiry. Capitalism is not an economic system; it is not a social system; it is a way of organizing nature.